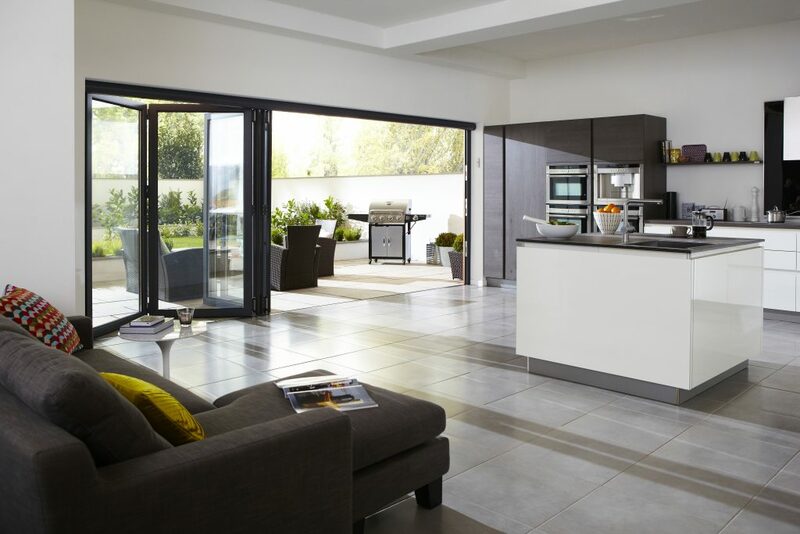 GHI’s stunning range of bi-fold doors are perfect for any home or location. Our aluminium profiles are strong, durable and require very minimal maintenance, guaranteeing total reliability and performance over a lifetime of use. These beautifully designed, versatile doors are suitable wherever you want to transform your home; living room, bedroom, kitchen or conservatory. The choice is yours. The modern aesthetics of GHI’s bi-fold door will add a touch of finesse to any external aspect of your home. When closed our bi-folds complement your home with a striking glass façade with attractive curved characteristics that are pleasing to the eye. Fold the sections back to give a stunning opening that draws the exterior ambience into the comfort of your home. GHI’s bi-fold doors come with all the assurances you would expect from a quality designed product. The aluminium profiles are designed to give strength and durability to ensure a structurally sound product that requires minimal maintenance and delivers reliable performance over a lifetime of use. GHI’s aluminium; bi-folds from Origin, the UK’s leading door manufacturer, a beautifully crafted system made from premium grade aluminium. These beautifully designed versatile, ultra-slim, lightweight, aluminium doors look stunning in any setting and can instantly transform any style of home. Every door delivers a smooth running free-glide system providing effortless closing. Its no boundaries threshold option ensures smooth uninterrupted access. Advanced weather tight colour coordinated seals combined with thermal efficiency guarantee optimum thermal performance every time. You can colour match doors to your home and existing colour schemes thanks to a wide range of powder coated RAL colours. If you have a sample colour then we will also do our best match to match it! 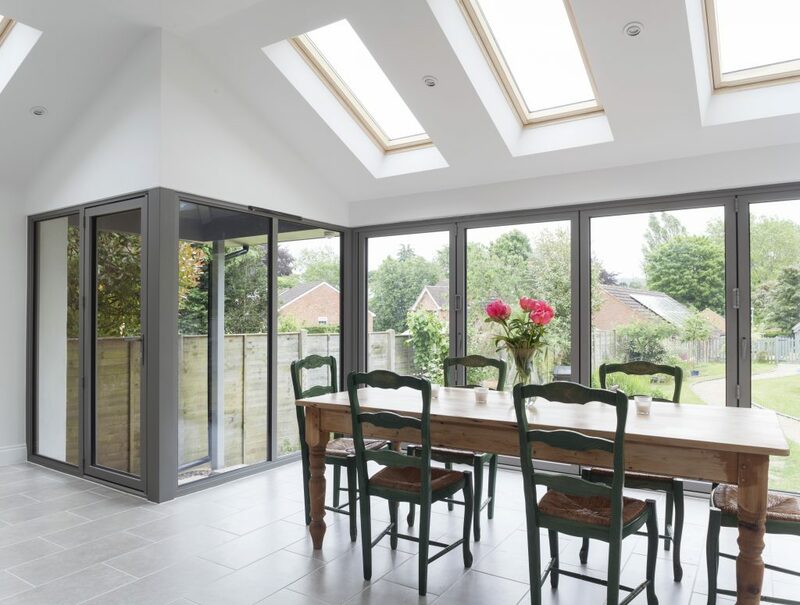 Visofold 1000 slide-folding doors feature a choice of internally or externally folding panels that help to integrate your home’s external and internal living spaces, delivering uninterrupted landscape views. They are the perfect alternative to sliding doors and ideal for opening up an entire wall or part of a conservatory. GHI’s Visofold doors also offer a choice of opening configurations to suit any application and style of home. Fold the sashes internally or externally, place the opening at the side, at one end, or create a single entrance door for easy access, or in the middle to give the option of a double door; the combinations are endless. Our manufacturers are committed to working towards a sustainable working environment and to ensure that every aspect of our activities is conducted in accordance with sound environmental practices.